The 2013 race for mayor has been under way for more than a year, but here was a first: This afternoon the six declared or likely candidates were all on one stage at the same time. 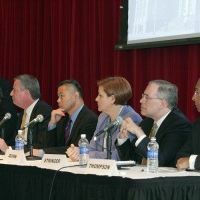 Tom Allon, Bill deBlasio, John Liu, Christine Quinn, Scott Stringer, and Bill Thompson were the closing act of a half-day conference at NYU devoted to boosting minority- and women-owned businesses. News flash: All the candidates are in favor of equal opportunity. And it’s a good thing that the event’s first speaker, Mayor Bloomberg, didn’t stick around after his breakfast address: All his aspiring successors think he’s done a lousy job in spreading the city-contracting wealth. The six City Hall seekers differed, somewhat, on the degree of Bloomberg’s lousiness. DeBlasio jumped at the chance to be the first to give the mayor an F grade; Quinn tried to get by with an “unsatisfactory” rating but the moderator, Times reporter David Chen, pressed, and Quinn blurted out, “C, C minus”; Stringer and Thompson drew groans from the audience for sticking with “incomplete” and “failing.” Liu stood out by being the only aspirant not to pledge to appoint a “chief diversity officer” if elected mayor — and Stringer stood out, somewhat awkwardly, by offering the job to Thompson — but otherwise the distinctions were more of style than substance. The most intriguing thing about the one-hour forum, organized by the newspaper City & State and AlliedBarton Security Services, was how it offered a preview of a major campaign theme. The buzzwords today were “economic justice” and “fairness,” but the subtext was the return of overt identity politics, with the candidates trying to appeal to groups who feel they’ve been shut out during the Bloomberg years. But of course it’s about both; it’s also about winning a left-of-center Democratic primary. Quinn tried to end things on an upbeat note: “Whoever the next mayor is, we have tremendous potential to get an A plus!” The important debate about race and class never goes away in this city — and it’s been a significant element of the recent wrangling over the NYPD’s stop-and-frisk tactics — but it’s about to become a larger and louder part of the political dialogue than it has been for the past decade.